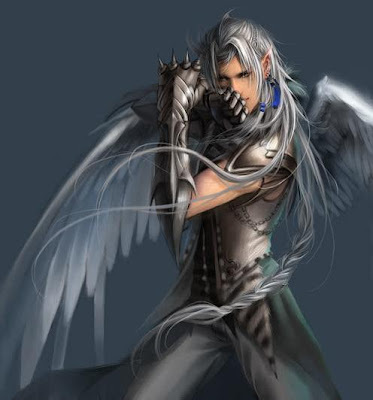 Shay Savage: Aasimar it is! I have to admit, I'm somewhat surprised by the outcome. I was sure you'd all go for the gladiators of the lost guy in trouble. The last one I expected was the one about a creature most people have never heard of before. I've been thinking about this one for a long time, so it will be good to get it down on (virtual) paper. I guess I will have to start working on this one after Otherwise Occupied is done! Now, artwork for such a story isn't going to be easy. I've done a little searching, but there just aren't many pics of Aasimars out there. I found the one below, which is PERFECT, but of course I have no idea who owns the rights to it. Any artists out there? LOL!